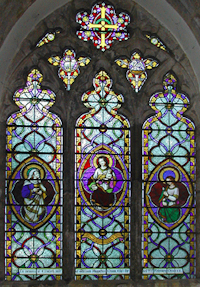 This page aims to provide a window through which you may be able to see something of this community of people and our historic church of St James. We welcome you as warmly as we would hope to welcome you if you are able to visit us in person. The church is normally opened daily from Easter until autumn. 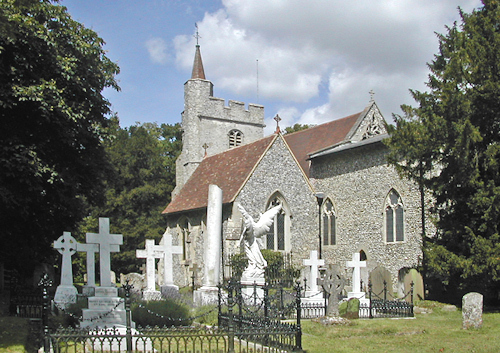 A church dedicated to St James was established around 1070. Over the last millennium it has evolved to meet the needs of the surrounding community of Sheldwich where people have lived since Roman times. Sheldwich (literally 'dwelling on a low hill') is about two miles south of Faversham in rural Kent. 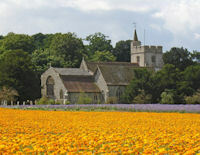 The church is part of a cluster which includes the villages (and churches) of Selling, Leaveland, and Badlesmere. St James contributes in varied ways to Sheldwich's community of about 200 dwellings and the rural setting is illustrated by the fact that we have no shop, pub, garage or Post Office: no street lights or mains drainage and a very infrequent bus service which bears the route number 666! Our excellent village primary school and the church are, therefore, especially important in enhancing the life of the village community. We proclaim the message of Jesus Christ by word, life and sacrament - such as special services to mark rites of passage. We offer unconditional care to people through prayer and visiting amongst other things. We keep the church open to visitors for prayer, reflection and learning. We aim to make and grow disciples. Our pattern of services has evolved to meet people's needs and preference. In Sheldwich (and the other cluster villages) there is no other worship centre and we try to make St James welcoming to all. Our current pattern to some extent brings different people on different weeks to take part in what they find helpful and gives the congregation as a whole more opportunity to be involved in delivering ministry. Week 1: 10am. Morning Worship lasting nearly an hour with hymns and a sermon. Week 2: 10am. Holy Communion (modern), with hymns and a sermon. Week 3: 10am. A half hour of worship with hymns/songs and a talk/drama, organised and run by the congregation, much enjoyed by families with young (and the rest!) The refreshments and chat afterwards tend to mean most people leave well after 11.00! Week 4: 10am. Holy Communion (modern) with hymns and a sermon. 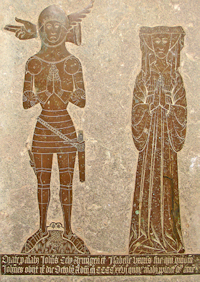 Our parish church has been at the centre of the community for a thousand years. We inherit the achievements and failures of those who have gone before us and pray that, with God's help we will bring about a better future in which the Christians in this ancient place meet the challenges of our broken world with practical faith. If you would like to know more about the village, please visit our Sheldwich Village page.You can learn more about the history of the village from Faversham Paper No. 94 Dwelling on a Low Hill written by Michael Johnson. Subtitled 'The story of Sheldwich in the wider context of its neighbours' this A4 book of almost 100 pages in total is available from The Faversham Society by mail order. The book contains almost 200 thumbnail photographs, most almost 100 years old. These are separately available as good quality JPEGS on a CD from the same source.